Chatbot Market « Global Market Insights, Inc. Technological advancement in communication is lately undergoing a once-in-a-decade paradigm shift. The growth of chatbot market bears evidence of this stupendous transformation, the impact of which is felt across the information technology domain. As artificial intelligence quickly spins out of the domain of academic research and enters mainstream business communication, an anticipated 80% of businesses expected to use some form of a chatbot. 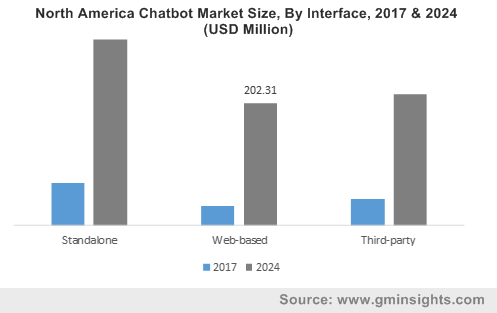 Driven by this extensive demand, chatbot market share will register a CAGR of 31% over 2018-2024. Tech giants, ranging from Facebook and Google to Apple, Amazon and Microsoft have made commendable investments in developing sophisticated AI. These companies are indeed being given a worthy competition by startups dedicated to chatbot development and machine learning tools. As the advancement of chatbots and the quality of the same are deeply grounded in AI, businesses will benefit extensively with AI expansion. The effect of AI expansion is becoming apparent in industries such as banking, hospitality tourism, education, etc. Incidentally, these businesses have also been progressing majorly as chatbot market depicts an expansion. In the past enterprises have tried to present a more professional image with the help of customer support personnel but often their unavailability over the phone has only backfired and frustrated the customer further. With chatbots, enterprises are updating to the 24*7 communication option and customers are deriving more satisfaction with the informed, non-intrusive and direct resolution of their queries. For instance, in the healthcare industry, hospitals have engaged chatbots to automate the process of booking doctor appointments. While such a conversation can be handled by a chatbot powered with Natural Language Understanding and AI, it eases the workload of the contact center by as much as 30% and makes hospitals more efficient, in turn strengthening the adoption of chatbots and augmenting the chatbot market growth. The chatbot market is at present being dominated by rule based and machine learning-based chatbots. While simple rule based chatbots are economic and effectively handle basic customer queries, their drawback is that they do not understand intent and context of a conversation. On the other hand, chatbots that are using pattern recognition, data analysis and predictive analytics as the three pillars for development are being more readily employed in businesses as all it takes for the chatbot to learn and enhance its data processing speed is continuous exposition and data feeding. This might explain why rule based chatbots, in 2017, despite having accounted for substantial market share, are forecast to remain modestly profit-oriented over 2018-2024. However, AI based chatbots, not surprisingly, are anticipated to record a CAGR of 53% during the same period. According to experts, financial and healthcare institutions will have an easier time adopting chatbots due to their structured processes that make automation easier. For instance, Bank of America’s chatbot Erica made major headlines, having registered 1 million users within 3 months. Financial advice provided by the chatbot and easy transaction searches are the factors that made Erica such a big hit. Analysts listed transactions with popular merchants such as Walmart, Uber, Amazon, Costco, etc., as among the top queries that customers search for. When Erica is asked to show all transactions with a particular merchant, such as Amazon, Erica lists all debit, credit and check transactions, which makes online banking much easier to keep track of. Banks all over the world have already employed some form of chatbot or the other, making BFSI one of the fastest growing segments of the chatbot market. It is essential to mention that chatbots are not being limited to a particular functionality. Instead, companies like Hugging Face are developing chatbots that can be used by teenagers to generate a digital friend to chat with and trade selfies. In a seed round, the startup raised $4 million for the development of a chatbot that focuses on emotions and entertainment. As per estimates, Hugging Face logs over a million messages per day. The aforementioned instance depicts that continuous research and development activities will characterize chatbot industry outlook in the years ahead, aiding the vertical to traverse a highly progressive growth path over 2018-2024. This entry was posted in Sustainable & Smart Technologies and tagged AI-Based, BFSI, Chatbot Market, Chatbot Market Analysis, Chatbot Market Growth, Chatbot Market Landscape, Chatbot Market Research, Chatbot Market Share, Chatbot Market Size, Chatbot Market Study, Chatbot Market Value, Cloud, Customer Service, E-Commerce, Entertainment, Healthcare, Marketing, Media, On-Premise, Order Processing, Payment, Retail, Rule Based, Social Media, Standalone, Third-Party, Tourism, Travel, Web-Based.